From 1950 until 1990, Kodak’s Coloramas were familiar to millions of commuters in New York City's Grand Central Terminal. The panoramic photographs—18 feet by 60 feet—presented an idealized view of life in 20th-century America and promoted photography as an essential leisure activity. Coloramas were promoted by Kodak as “the world’s largest photographs” and called “technically remarkable” by Ansel Adams, who photographed several. The towering backlit transparencies were 18-feet high and 60-feet wide, each illuminated by more than a mile of tubing. Presidential State of the Union Address, Capitol Building, Washington D.C.
To celebrate America's Bicentennial, the Capitol's House of Representatives was completely refurbished. A pair of Coloramas documented the results as Congress listened to President Ford's 2nd State of the Union message. Both sides of the aisle were shown in consecutive Grand Central displays to assure full representation of all members of Congress and Federal officials. Skier and plane on a glacier high in the Swiss Alps, with Matterhorn in background. Displayed in Grand Central Station January 27--February 17, 1964. Koalas are nocturnal animals that play at night and eat eucalyptus leaves during the day. Scientists think the leaves bring on a kind of drug-induced stupor that presented one challenge in getting this photo. Another challenge was trying to get the koalas to leave the shade during the heat of the day. For three days Neil Montanus worked with the animals with little success. Finally, a model was brought in to talk to the koalas, keep them awake, and help get this shot. Some of the best Coloramas never saw the light of day. Recently discovered in Neil's archives were more than a hundred Coloramas which were never chosen by Kodak to be displayed in Grand Central Station. Many of these Coloramas have not been seen in more than 40 years. This collection is quite remarkable and is viewable upon request. 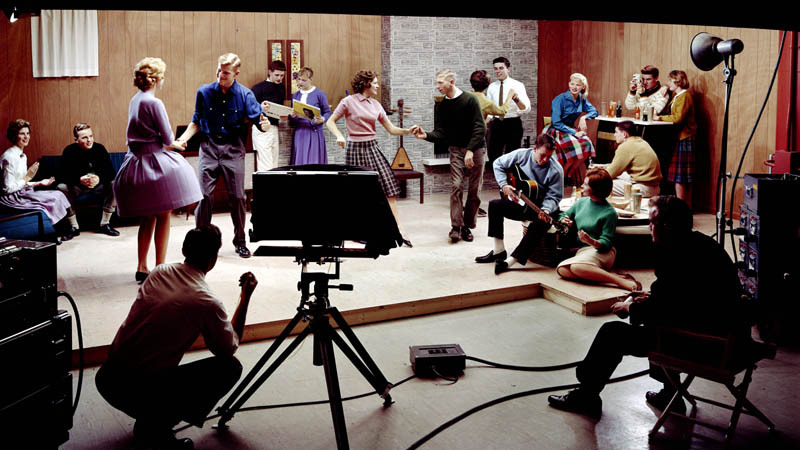 Neil shooting the 'Teen Dance' Colorama at Kodak studios on State Street in Rochester, NY. “These illuminated images reflected and reinforced American values and aspirations while encouraging picture-taking as an essential aspect of leisure, travel, and family,” said Dr. Alison Nordström, Eastman House curator of photographs, “The Coloramas taught us not only what to photograph, but how to see the world as though it were a photograph. They served to manifest and visualize values that even then were seen as nostalgic and in jeopardy, salvageable only through the time-defying alchemy of Kodak cameras and film.” A constant in the first two decades of Colorama was a model using a Kodak camera, photographing family, an activity, or beautiful scene. “Coloramas resonate with nostalgia, a staple in Kodak advertising since at least 1900, reminding us to pause, via photography, in the midst of present enjoyment to record it for later remembrance,” Nordström said. In addition to Adams, well-known names associated with Colorama include photographer Elliot Porter, artist Norman Rockwell who art-directed a Colorama, and TV’s Ozzie and Harriett who appeared in several. Colorama was a technical feat undertaken by Kodak’s advertising and photography teams. Making the exposures for each display was a full day’s work in almost total darkness. In early years the wet 20-foot transparencies were dried overnight in the swimming pool at Kodak’s employee recreation center — the only building large enough to accommodate Coloramas-in-the-making.